Dr. George M. Rapier, III, MD founded WellMed Medical Management in 1990 with a single clinic in the San Antonio Medical Center and a big vision – to change the face of healthcare delivery for seniors. Today, WellMed’s network of primary care providers offers more than 900 medical office locations in Texas and Florida with more than 9,100 primary care providers. Along the Treasure Coast of Florida, patients are served at four WellMed medical office locations and 21 affiliated provider locations. Our WellMed-owned offices are located in Fort Pierce, Port St. Lucie, Sebastian, and Stuart and offer a variety of services including on-site labs. We care about how we treat you throughout your entire visit. Upon entering a medical office, the receptionist will welcome you and check you in to your appointment. We treat you like family rather than another number waiting to be called in the lobby. Appointments are educational and doctors spend time with you to help you understand your care plan. 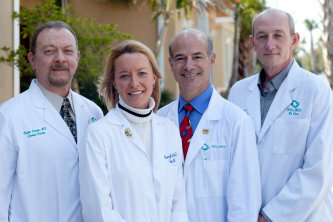 Patients in the Treasure Coast region have access to several WellMed primary care physicians. They include Dr. Christopher Rao & Dr. Monica Brown (Stuart), Dr. Cheryl Winchell & Dr. Marie Prinsen (Sebastian) and Dr. Helwey Mustafa (Fort Pierce) and Dr. Nestor Lacayo & Dr. Bambi Petrinic (St. Lucie West). Additionally, WellMed supports several independent primary care providers in the region who specialize in senior care. We’re dedicated to providing a positive patient experience to all our patients. Our coordinated care model includes a proactive, preventive approach to health care, such as seeing you more often for regular health screenings aimed at keeping you healthy and out of the hospital. Our doctors engage you in your own health care to build a custom care plan designed around your lifestyle and health needs. Today, WellMed serves more than 280,000 patients across both Texas and Florida. We strive to provide a red carpet level of care that will help improve your health. After all, it’s our goal to help you live a longer, healthier life so you can focus on enjoying what you love most. The WellMed Charitable Foundation is a non-profit 501(c)3 organization that supports seniors and their caregivers with a special emphasis on wellness, prevention and living with chronic illness. Recently, the Foundation made a generous contribution of $10,000 to St. Lucie Habitat for Humanity; which will provide a " hand-up" to seniors who need to make small improvements and repairs to their homes. Improving living conditions while providing a little face lift to existing neighborhoods is what Aging in Place is all about. Applicants interested in receive funds from this grant must must comply with all fair housing standards and low wealth application guidelines.